【明報專訊】"Hello, there," Esper said on the telephone. "I wish to order one of your super special pizzas. The eighteen-inch one with anchovies (鹹鯷魚), mushrooms, olives and sausage," he said. "Sure," the person at the other end of the telephone said. "And where would you like that to be delivered?" "Deliver it to us on Mars," Esper answered. "Sure, no problem," the man said, hanging up (掛斷電話). 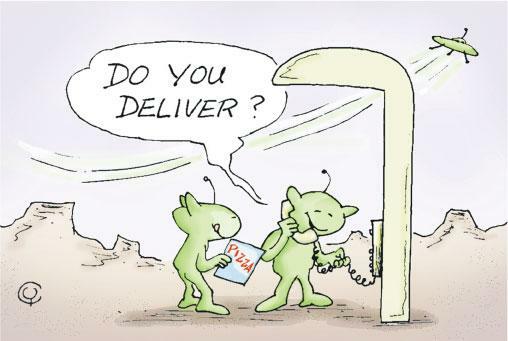 Deliver to is to convey a thing from one place to another.